In a surprise announcement, the project to restore three lost World War I memorials on Governors Island were named national war memorials by a group of U.S. historians and veterans organizations. Governors Island joins 99 other sites across the U.S. to be chosen for national designation this month. The 2016-2017 project replaced and restored three lost or damaged WWI memorials on the island. They are for Private Merle Hay, one of the first Americans killed in combat; Captain Harry Kimmell, missing in action and awarded the Distinguished Service Cross; and a tree memorial dedicated to General John J. Pershing, commander of the American Expeditionary Forces, who departed for France from Fort Jay. The memorials were restored on time (and on budget) in September 2017. 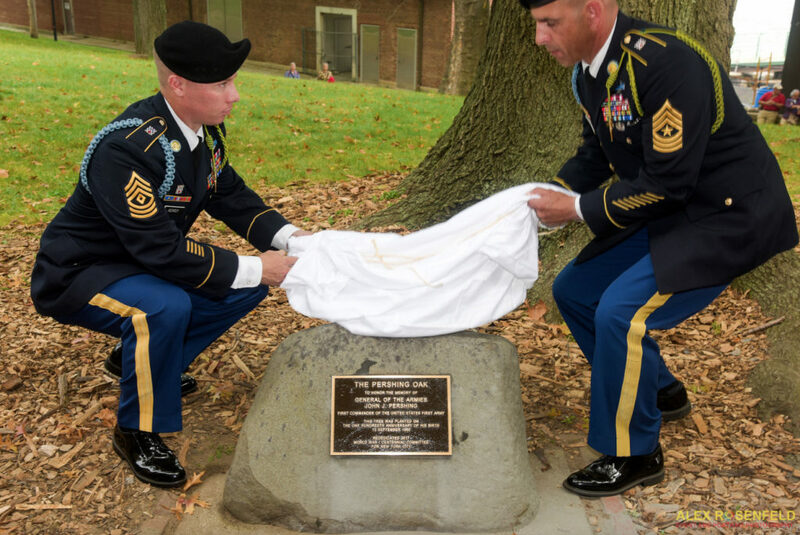 A grand two-day rededication ceremony was part of Camp Doughboy WWI History Weekend. The U.S. Army sent men from the Sixteenth Infantry Regiment, 1st Division, to lead the ceremonies. Reenactors from the Long Island Living History Association and the East Coast Doughboys dressed in WWI uniforms took part. The project had the support of the Trust for Governors Island, the National Park Service, and the World War One Centennial Committee for New York City. Kevin C. Fitzpatrick was the project manager. All 100 memorials, in all 100 cities have now been designated including such national landmarks as: Chicago’s Soldier Field, Los Angeles Memorial Coliseum, San Francisco’s War Memorial Veterans Building and Opera House, Honolulu’s Natatorium, and Washington, D.C.’s National World War I Memorial at Pershing Park. In addition, many smaller local community projects are being recognized such as: Scranton Pennsylvania’s Col. Frank Duffy Memorial Bridge and Park, Cape May, New Jersey’s Soldiers and Sailors Monument, Ocean Springs, Mississippi’s Emile Ladnier WWI Memorial, and the North Carolina State University Memorial Bell Tower, to name just a few. The newly-designated memorials are in 37 different states and each will receive a $2,000 matching grant, towards the restoration, conservation and maintenance of these local historical treasures. The 100 Cities/100 Memorials program was created to help draw attention to WWI memorials across the United States, and enables all of America to take part in the WWI centennial commemoration. Many of these WWI memorials have deteriorated due to the ravages of time, exposure to the elements, neglect, and even vandalism. For more information about the 100 Cities/100 Memorials, to view an official project timeline, visit here.